Five all-beef or turkey hot dogs, cut into four bite size pieces will make 24 mini corn dogs. One package of hot dogs will make 48 mini corn dogs, which means you won’t get stuck with those two left over hot dog buns. As silly as that may sound, it really bothers me when I’m left with two hot dog buns…that I have no idea what I’m going to do with. I usually throw them out, which is such a waste. Okay, I’m getting off the subject here, now back to the recipe at hand. I have two mini muffin tin pans. Each pan makes 24 mini muffins, so I can make 48 mini corn dogs in one swoop. Spraying the mini muffin tin pans with non-stick cooking spray makes removing the mini corn muffins and clean-up really easy. 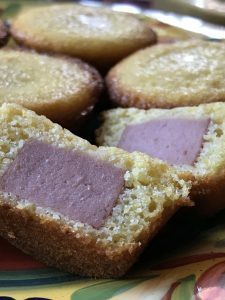 This recipe calls for making your own cornmeal muffin batter. 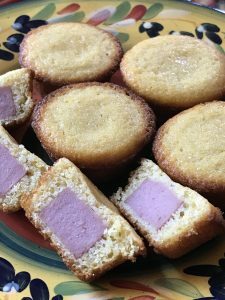 If time isn’t on your side and you need to hurry things along, you can easily use a boxed corn muffin mix. I like Krusteaz Honey Cornbread Mix, but you can use your favorite brand. 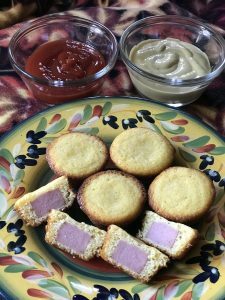 If you want to make assembly of these mini corn dogs less messy, super easy and fast, I like to use a #30 cookie scoop. A few years ago, I bought my brand new cookie scoop at a thrift store for $1.00. At the time, I didn’t know what I was going to use it for or if I’d ever even use it, but I’m a sucker for kitchen gadgets so I bought it. Now I’m not sure what I’d do without it! I use this handy, dandy cookie scoop for so many different things. It’s not only great for making cookies, but it’s great for scooping any type of batter, sweet or savory, ice cream, whipped cream and it’s fantastic for making peanut clusters, coconut clusters and peanut butter balls for dipping. Mini Corn Dogs are great served as an appetizer during any football game. 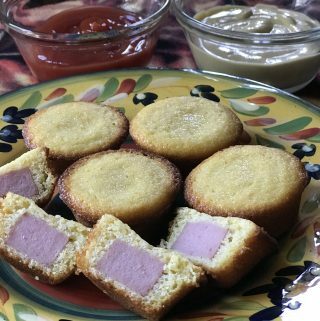 Kids and adults alike love these mini corn dogs. Mini Corn Dogs are fantastic served for any occasion. 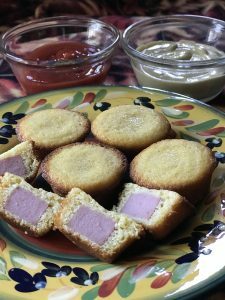 Mini Corn Dogs are great served as an appetizer on Game Day or for a Children's Birthday Party. Combine butter and sugar in a large bowl, whisk to combine. Add eggs, whisk to incorporate, add buttermilk and whisk again to incorporate. In a separate bowl, combine baking soda, cornmeal, flour, and salt. Stir to combine. Whisk into wet ingredients, in two batches. Spray a mini muffin tin with non-stick cooking spray. Spoon one tablespoon batter into each mini muffin cup. Place one hot dog bite into the middle of each cup. Bake for 15 to 20 minutes or until corn bread is golden brown. Remove from oven and transfer to a wire rack to cool. Serve with ketchup and mustard. Mini Corn Dogs are very economical. Five regular size hot dogs, make 24 mini corn dogs, which will easily serve 6 hungry kids. Serve mini corn dogs with potato chips and fresh fruit.